I decided to bring this short video as a “satire” but as sad as it looks, too many times, the Israeli reality is not that far from the pathetic behavior in this video. In 2015, there were 48000 work related injuries. The National Insurance paid 4.5 Billion shekels in compensation to those injured. 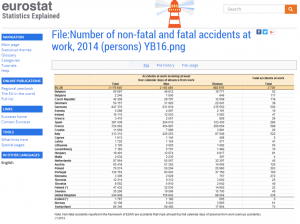 In 2016 the number of deaths from workplace accidents reached the exuberant number of 80 deaths. The psychological term for blaming others is “Psychological projection” that is a theory in psychology in which humans defend themselves against their own unconscious impulses or qualities by denying their existence in themselves while attributing them to others. We are responsible – every one of us should take part in mending this situation, which is reversible, it is possible to minimize damages. We must stand for our rights to have a safe workplace environment. If you feel in danger in your workplace, do not wait until something happens. Report immediately to your superior and if no action is taken immediately by those in charge, please contact a lawyer for guidance.